Calling All Nancy Drew® Fans! We're solving the mystery of the missing Nancy Drew® fan collectibles with our Vintage Nancy Drew® inspired shop at Cafe Press! Officially licensed merchandise brought to you by Nancy Drew Sleuths fan club. Browse through our store sections for a few clues to rediscovering your favorite sleuth. 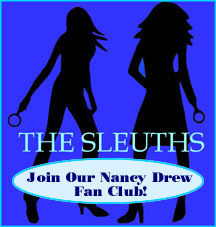 We have Nancy Drew® merchandise and our own Nancy Drew Sleuths Fan Club logos to shop from. Hop in your snappy roadster for a ride down memory lane--but don't forget extra batteries for your flashlight! 2016 Nancy Drew Calendars now available--calendar styles below! Want to attend a Nancy Drew® convention? Check out our website for more convention details--2016 will find us sleuthing in New Orleans. Nancy Drew Silhouette: 5 Colors!